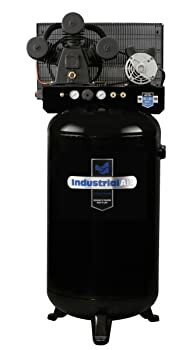 Just as the name suggests, this air compressor is designed to handle commercial and industrial level air tools. Better yet, given the high power the tool produces, you have no limits to the type of tools you can couple with it. If you wish, you can inflate truck size tires, do automotive level paintings, handle nailers, and even multitask different tasks. The only downside about this appliance is it is a bit too heavy to lift up. This limits your ability to move it around.